Workers search for survivors, including Rick Santos, who was rescued after 50 hours pinned in the hotel rubble. (CNN) -- Rick Santos has two missions in Haiti this time around. The first is expected of a man who heads the aid agency IMA World Health -- he will oversee a mass drug administration campaign for neglected tropical diseases. But the second mission is much more personal, one that many in Santos' position might never consider. In a few days, Santos hopes to stand in front of the rubble of the Montana, the upscale hotel, popular with foreigners, that collapsed in Haiti's devastating January 12 earthquake. He will look at whatever is left and think back to the 50 harrowing hours he survived pinned under concrete. He was in the hotel's lobby on that fateful Tuesday evening when he saw the chandelier swing. Then the entire building came crashing down on him. He feared that no one would come to rescue him. He and five colleagues shared a few things Santos kept stashed for two young children: a Tootsie Pop, gum. But he drew fortitude from conversation with his co-workers that fueled hope until rescuers found them. Two of his colleagues didn't make it. Santos was one of the lucky ones. The head of the humanitarian aid group appeared on CNN, telling his tale of survival, before he returned home to Maryland to resume his life. But there's no guidebook for how to overcome personal trauma. And Santos, 46, even with his two decades of aid and development experience, found it difficult to move forward. He had witnessed the aftermath of the 2004 tsunami in Asia and had seen human beings hungry and suffering. But in Haiti, he, too, had become a victim. 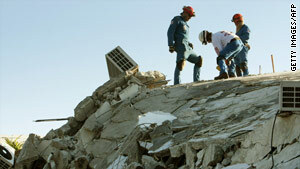 Few aid agencies in Haiti were spared the sting of the earthquake. Staffers died or lost loved ones and their homes. The United Nations lost 96 members of its mission. Santos said he is going back to Port-au-Prince without trepidation, though his wife has reservations about what kind of reaction her husband might have. Santos just wants to close that wretched chapter in his life. "I don't know what it's going to dredge up, but I need to move forward," he said. "I feel very strongly that I need to go." Since the quake, he has spoken with colleagues who survived and with the widow of Sam Dixon, a friend who died. But he felt the need to see the place where he thought he would die, where he finally heard the sound of sledgehammers, where he screamed and banged on walls, desperate for someone to find him. Incredibly, French firefighters pulled him from a 2-foot hole in the concrete two days after everything had come tumbling down. His wife watched his dramatic rescue on television. The images he has tried to tuck away will come rushing back in Port-au-Prince next week. He said it will be important to again see the city, many parts of it still in ruin. Santos said he realizes now he will be forever connected with Haiti, the nation he saw for the first time two days before the earthquake. He had gone to help administer a program to combat neglected diseases. Unlike HIV/AIDS or malaria, they are illnesses that inflict extreme suffering and disability without making headlines. They include the disfiguring elephantiasis, a mosquito-borne sickness that blocks the body's lymphatic nodes. Or lymphatic filariasis and soil-transmitted helminthes, intestinal worms found mostly in children. Now, Santos will resume the health work. IMA hopes to vaccinate as many as 4 million Haitians this year. It will take many years to overcome both the health crisis and the suffering inflicted by the earthquake, Santos said. He hopes to be part of Haiti's long journey. First stop: Hotel Montana.